A few days ago, on the 1st, another adventure in sugary breakfast cereals (and their names and their mascots): “Sweet stuff”, with a section on Trix Fruity Shapes. From the conglomerate General Mills, with a hyperactive rabbit mascot and the — to some ears — suggestive fruity in the name, plus enough sugar to make the stuff eligible to be labeled candy. 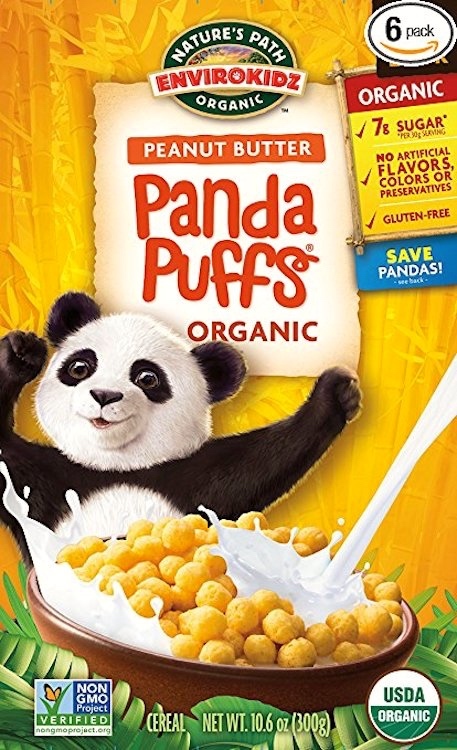 Now, thanks to a visit to the cereal section of my local Whole Foods, I can report on lower-sugar alternatives from two small environmentally earnest companies — still with adorable mascots and cute names. 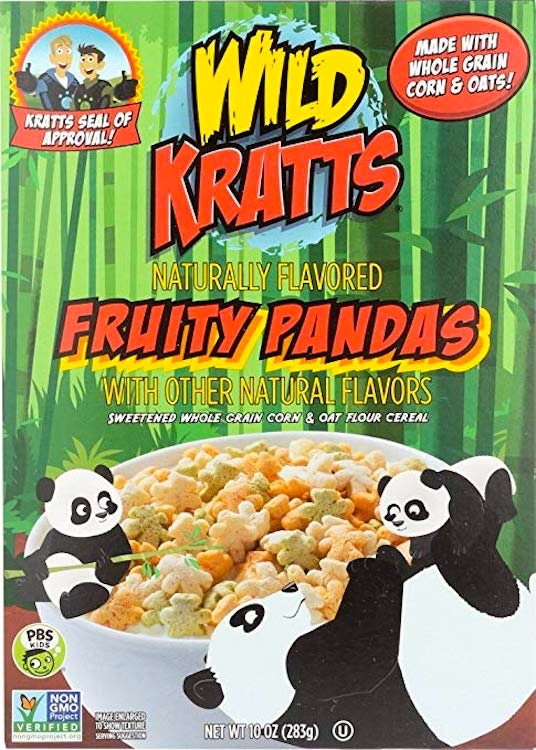 On the panda watch: Panda Puffs (from EnviroKidz) and, I suppose inevitably, Fruity Pandas (from Wild Kratts). Yes, fruity poofs, playful and good for you too. Here at EnviroKidz our mission is not only to make delicious organic food for kids, but to help save animals and the planet. That’s why each box features real life animals – animals who we support every time you choose one of our cereals, bars, or oatmeals. Whole Foods Market teamed up with the hit PBS KIDS show Wild Kratts to create a line of products perfect for back-to-school. We sat down with brothers and co-stars Chris and Martin Kratt for an interview to find out about how they created the wildy popular program, their very favorite “creature powers, what kids can do to help protect animals, and so much more. Find the collection of products in Whole Foods Market stores now. Wild Kratts (stylized as WILD KRATTS) is an American-Canadian educational children’s live-action/animated series created by Chris and Martin Kratt. The Kratt Brothers Company and 9 Story Media Group produce the show, which is presented by PBS in the United States. The show’s aim is to educate children about biology, zoology, and ecology, and teach kids small ways to make big impacts. It has ties to the Kratts’ previous show, Zoboomafoo, and contains many of its characters. The brothers grew up in Warren Township NJ: Martin Kratt b. 12/23/65, BS in Zoology from Duke Univ. ; Chris Katt b. 7/19/69, BA in Biology from Carleton College. This entry was posted on November 4, 2018 at 7:05 pm and is filed under Language and food, Mascots, Movies and tv, Panda postings, Signs and symbols, Taboo language and slurs. You can follow any responses to this entry through the RSS 2.0 feed. You can leave a response, or trackback from your own site.